Welcome to Surf to Sunset! Looking for a vacation rental in the Daytona Beach area? Rent a piece of paradise for your next vacation or winter away from the cold. Beautifully updated Spanish-style beachside home with 2 bedroom / 2 bath, sleeps 6. 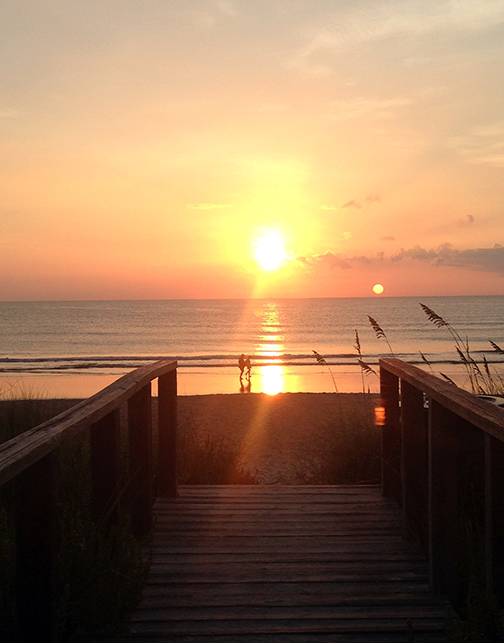 Surf to Sunset is located in beautiful Ormond-by-the-Sea, Florida, just north of Daytona Beach. Our single-family home in a quiet, friendly neighborhood, is newly remodeled and steps from the Atlantic Ocean with a private community deck on the beach and 1 block from a private dock on the Intracoastal. Wake up and enjoy the sunrise over the beach, surf the waves, catch some rays, then end your day on our private neighborhood dock on the Halifax River (Intracoastal Waterway) and watch the sunset with your favorite cocktail in hand. Master bedroom with queen bed and en-suite 1/2 bathroom. Large closet and bureau. Groceries, restaurants, everything you need within 1-2 miles. Price: $650 – $1500 USD per week, depending on season and event weeks. Beautiful and spacious Spanish-style beach house, 2bd, 2 bath, 2-car garage, steps to the Atlantic and Intracoastal. A warm welcome as you enter the home. Beautiful, newly renovated kitchen with granite counters, opens to dining and living areas. Large, comfy living room with queen-size sofa bed and large TV with cable. Lots of games, books, and cards for your rainy-day entertainment. Large dining area seats six guests. Master bedroom with en-suite 1/2 bathroom, overlooks the front patio and palm trees, includes 44″ tv, designer linens, ceiling fan, and alarm clock. Large, bright bathroom attached to the master bedroom. Second bedroom with 2 twin beds, includes bureau, 32″ TV, xbox 360, and ample closet space. Enjoy evening cocktails outdoors without the sting of mosquitoes. The screened lanai is large enough for dinner, drinks, card games or just relaxing. Our beautiful private neighborhood pier on the Intracoastal. Protected sea turtle nests lining the beach. Watch rockets launch from Kennedy Space Center from our beach.